Tuesday is the day of the week between Monday and Wednesday. In some countries, for example the United States of America, Tuesday is the third day of the week. In other parts of the world, Tuesday is the second day of the week. The name Tuesday comes from a Middle English word, Tiwesday. This word came from the Old English word Tiwes dæg. This was named after the Nordic god Tyr. 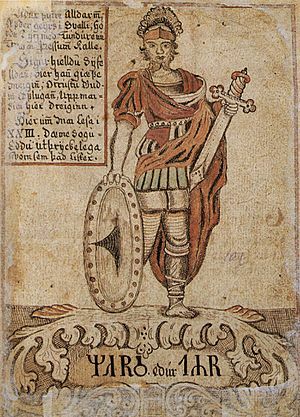 Tyr was the God of War, like the Roman war god Mars, and Greek god Ares. In Latin, Tuesday is called Martis dies which means "Mars's Day". In French, Spanish, Italian and Romanian, the (Romance languages), the word for "Tuesday" is nearly the same as the Latin name. Tuesday is mardi in French, martes in Spanish, martedì in Italian, dimarts in Catalan, and marţi in Romanian. The Celtic languages still spoken use the Latin names, even though none of these languages came from Latin. Tuesday is dé máirt in Irish, Meurzh in Breton, dydd Mawrth in Welsh and Dimàirt in Scottish Gaelic. Tuesday Facts for Kids. Kiddle Encyclopedia.